I think the guidebook says that 5000 cfs on the Three Lynx Gauge is the high end of flows for the Upper Upper Upper Clackamas, also known as the June Creek section. 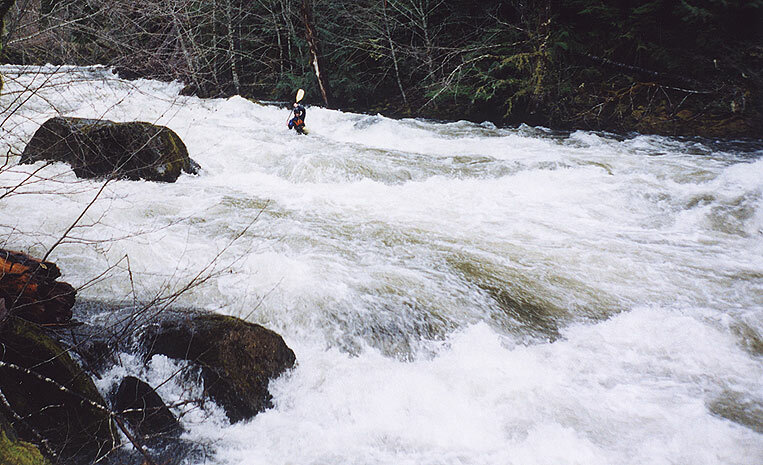 Well, double that and you've got yourself a fun day of paddling, pretty much optimal flows in my humble opinion.. Pete and I wandered up the Clackamas during the floods of 2003 and decided that it looked pretty good. I'm pretty sure we started at the put-in described in the guidebook, and ripped off downstream. There were some pretty cool drops at this flow, and the rest of the river was smokin' fast with sweet surf waves and violent eddylines. 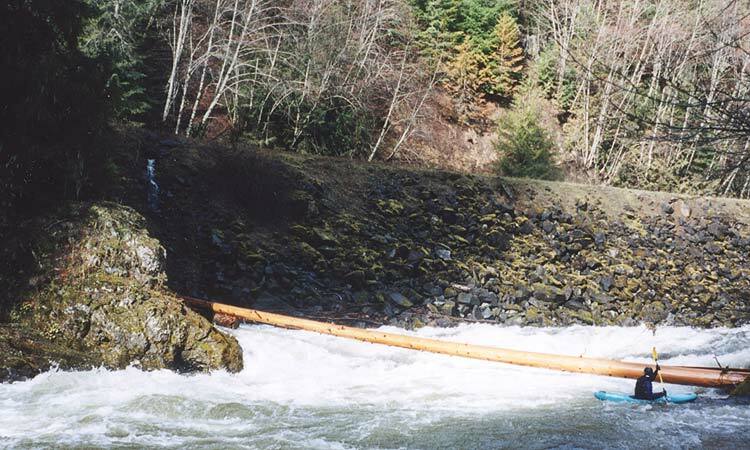 The old version of Soggy Sneakers warns against doing this run due to cabled logs in the river. It is true that some remnants of that failed Forest Service Policy are still lurking in the river, but they aren't much of a concern at this flow. There were a few trees here and there though..
Pete eddies out below a particularly annoying log on a left corner. Here's some photos of our trip. Very fun stuff! 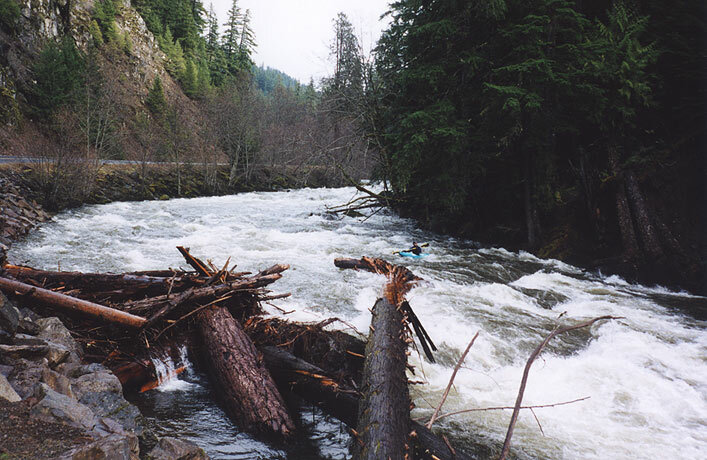 There are a couple of larger rapids on ther run, which were really fun at this flow. The first is kind of a twisty drop past a hole, marked by large boulders on a gradual right corner. This drop was greatly amplified at this flow, and had a large, river-wide hole in it's place. The best line was along the right, where the hole was weakest, but it was pretty hard to get there because the river was pushing hard to the left the whole way down. Below this rapid were non-stop wave trains, etc, until we got to the final rapid on the river. 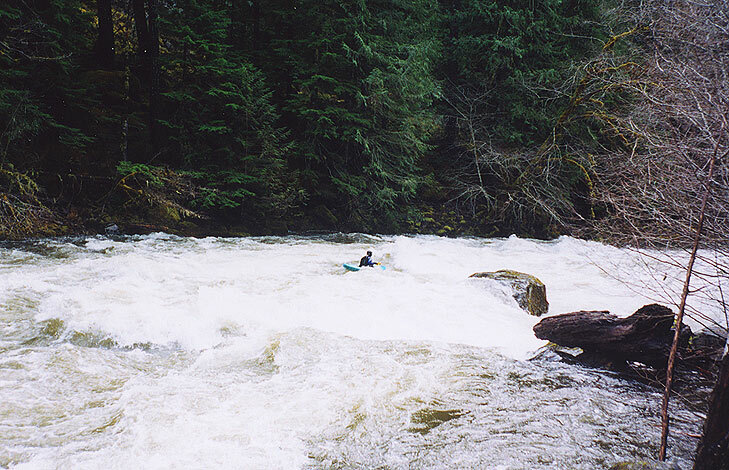 At this flow it was the highlight of the trip, a two-hundred yard long slalom through huge, breaking waves and river-wide holes. Very fun stuff! It took us about 10 minutes to scout this drop (walking along the road to ensure there wasn't any wood hiding anywhere) and about 30 seconds to run it. I got cartwheeled in the river-wide hole in this drop; always spices things up a bit..
Pete cruises down into the final rapid on the June Creek section. Pete charges down into the river-wide hole that cartwheeled me..